About 20 years I had a half way house that came to me and wanted a virtually indestructible waterproof group bathroom. They needed it to be like a shower enclosure for the entire bathroom, and toilet facility. It needed to be easy to thoroughly clean and disinfect. The resulting system allows you to hose down the entire ceiling, wall and floors. The system that we developed is a completely seamless, waterproof ceiling and coating system. This epoxy ceiling and wall coating is seamlessly integrated with a seamless flooring system. This system is now being used for everything from clean rooms to animal facilities to car washes, daycare centers, assisted living facilities, food processing facilities and more. Prime the ceiling and walls with Epoxy.com Product #899 Primer – www.epoxy.com/899.aspx. Product #899 Primer is a 100% solids, low viscosity, moisture tolerant epoxy. It soaks deeply into the substrate, verifies surface preparation, and helps to prevent the much thicker coating from getting bubbles that may be cause by air or moisture trying to escape from the substrate during curing. Allow primer to get hard to the touch. Before the epoxy primer is 24 hours old (and after the primer is hard to the touch) apply a coat of Epoxy.com Product #1W. The 1W – Wall Coating is 100% solids. It comes in a range of different colors. This means it is zero (0) VOC with no solvent. Just like the 899 Primer the 1W has very little odor. 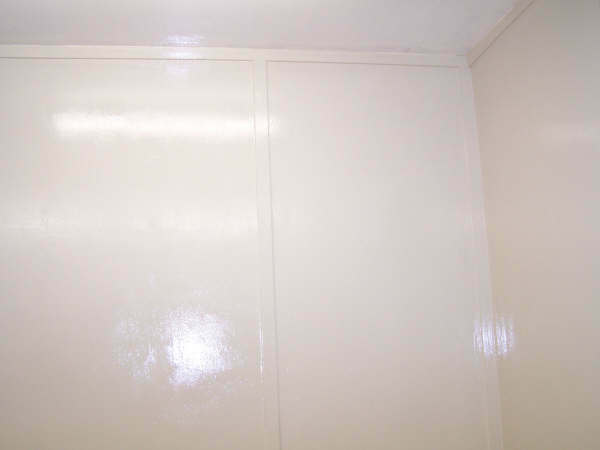 We have even more chemical resistant wall coatings for applications where it is chemicals that are being splashed or sprayed. Contact us if you have strong chemical exposures that you want to contain instead of water. Let the first coat harden to the touch and before 24 hours add another coat of #1W. Allow the coating to dry over night. Typically the cove is only installed if you are going to install one of the multi-colored flooring systems (Waterproof Floor Options 2 & 3below). Cove is covered in an earlier blog – https://news.epoxy.com/2014/06/25/seamless-epoxy-cove-installation-instructions/. The cove gives you a radius at the bottom of the wall making the floor to wall transition easy to clean and esthetically pleasing. There are multiple systems that you can use for your seamless flooring portion of the system. Floor Coating System – www.epoxy.com/1.htm. Product #1 applies with the Product #899 primer under it and in 2 coats just like the 1W. The Product #1 is thinner and flattens better on a floor than the Product #1W. You can also add an optional anti-skid to the #1 Floor Coating. The #1 comes in all the variety of colors of #1W. Chip Flooring System – www.epoxy.com/chip.aspx is a two component 100% Chemical Resistant Epoxy Chip Flooring. System #315 Seamless Epoxy Multi-Colored Chip Flooring is available in virtually limitless color combinations. If your job is big enough our chips can be pigmented to match all the colors of many major paint companies. We can color match our base coat colors as well. Unless the pigments for your custom colored 315 Basecoat are unusually expensive we can color match for a modest small batch charge or at no charge for larger orders. Even our standard color pallet offers you over 45 chip colors that can be blended in any combination and percentage as you want. This gives you the architectural choices you need. The top coating for this system is highly UV resistant so since it doesn’t chalk indoors it can last and look great for decades. Quartz Flooring System with Product #15 – www.epoxy.com/15.aspx – is also an excellent flooring system for those who like the colored sand look with a good midrange chemical resistant system. We can also help you to combine the systems above with our Novolac Epoxy Systems – www.epoxy.com/novolac.aspx for highly chemically resistant versions of those systems. You can also install an Electro-Static Dissipative or Conductive system www.epoxy.com/conductive.aspx. In conclusion the systems above are only a small fraction of the possibilities. With our wide range of colors and chemically resistant systems the possibilities are endless. Please contact Epoxy.com Technical assistance at 352-533-2106 or email me directly at norm@epoxy.com. This entry was posted on Thursday, August 7th, 2014 at 12:34 and is filed under Chemical Resistance, Chemical Resistant Epoxy, Chemical Resistant Paint, Epoxy, Fast Setting, General Interest, seamless epoxy cove, seamless epoxy floor coatings, seamless epoxy flooring system, Seamless Epoxy Flooring Systems, waterproof. You can follow any responses to this entry through the RSS 2.0 feed. You can leave a response, or trackback from your own site.